We provide orthodontic services to both children and adults. Our team of professionals includes an Invisalign accredited dentist. A combination of orthodontic therapies not only improves the appearance of your teeth, but the function and life span as well. Our approach to orthodontic care is based on the function of our patients’ teeth. Teeth that are crowded or misaligned are more likely to wear prematurely, develop gum disease and experience tooth decay. By correcting the alignment of your teeth you will experience an overall improvement in the health of your smile. Traditional braces are one of the most cost effective methods of orthodontic treatment and are ideal for patients with more severe corrective needs. Treatment time is typically one to two years, depending on the anatomy of the patient. Most children opt for traditional braces, which use metal brackets and wires. Other forms of traditional braces include tooth-coloured brackets, and self-litigating brackets, which may be more comfortable to wear. Our Invisalign accredited dentist is able to provide complete orthodontic care through the use of Invisalign clear alignment trays. Each set of trays is worn for two to three weeks before being replaced with the next set of trays in the series. This unique approach allows the teeth to be moved without the use of traditional braces. Invisalign patients love that there are no dietary restrictions, and keeping their teeth clean is as simple as removing the aligners to brush and floss as normal. Invisalign patients also require less frequent visits to our office because there is no need for adjustments, and the trays are sent home with the patient in advance. 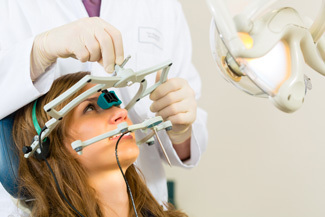 The growth and development of jaw positioning can make a dramatic impact on the way your teeth function. A jaw that is too far back or too far forward can also strain the TMJ area and create aesthetic concerns with the facial profile. With growth modification and jaw repositioning, our dentists can correct the position of the lower jaw so that the entire mouth functions the way nature intended. Orthodontic plates are useful in guiding tooth eruption, development of the jaws, palate, and decreasing orthodontic treatment needs later on. Early assessment of your child’s smile can determine if proper development is taking place. If intervention is needed, an orthodontic plate may be used to encourage proper development and retain the necessary space for the erupting permanent teeth. These plates are removable and used to lessen future orthodontic treatments. Call us on (09) 412-9507 or contact us online.